Notice: This is an old thread. The last post was 1982 days ago. If your post is not directly related to this discussion please consider making a new thread. There are tremendous benefits to feeding ruminants nitrogen and phosphorus supplements, in terms of milk production and productivity. However, what goes in must come out. Nitrogen and phosphorus excretions from dairy cattle are a major environmental pollutant. 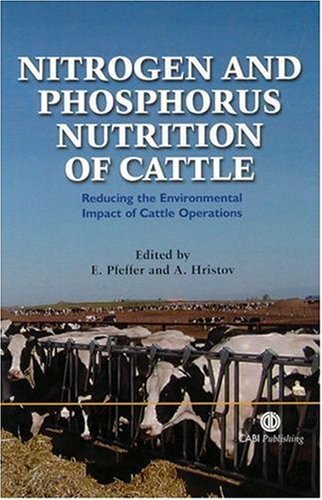 This book describes the latest knowledge in nitrogen and phosphorus nutrition of cattle including requirements, ruminal and total tract metabolism, possibilities of increasing the efficiency of nitrogen utilization and reducing nitrogen and phosphorus excretions from dairy and beef operations. It also includes aspects of the effects of dietary nitrogen and phsophorus on the reproductive efficiency of cattle. This book will be of interest to researchers in animal nutrition, animal science, and environmental (pollution) science. Last edited by Motoko; 14th November 2013 at 12:53 PM. Reason: LOCK INFO AS REQUESTED.